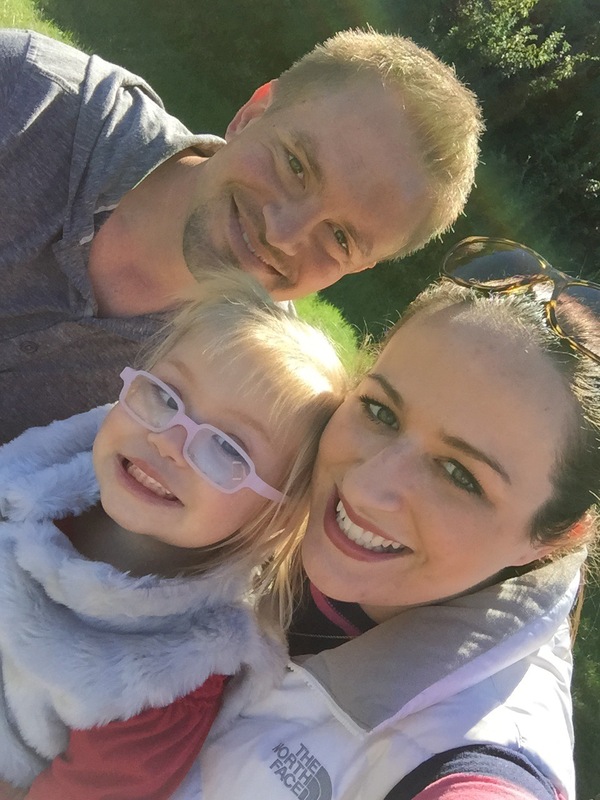 It’s been a while since I’ve done an update on our sweet little O. It’s true what they say about time flying. 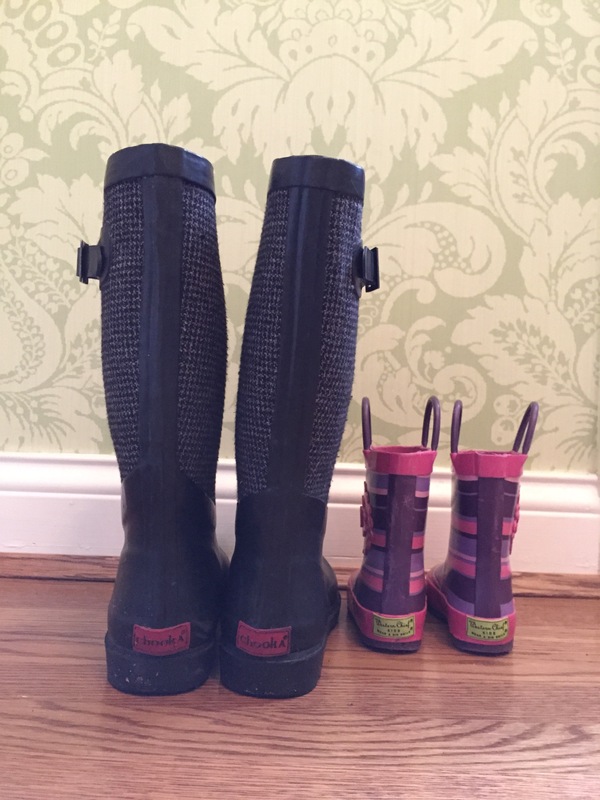 We’ve been having a blast with O and all of her toddler adventures. And I’ve just realized she’s not so little anymore. 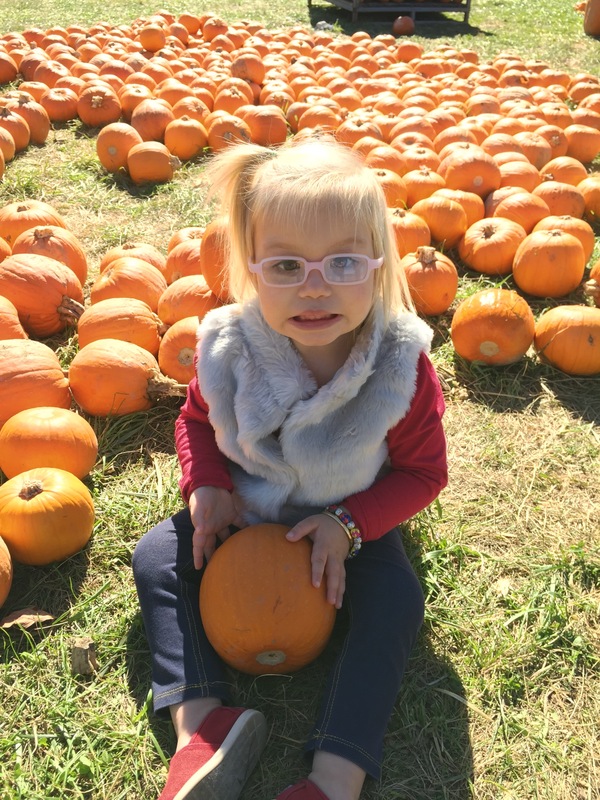 We headed to the pumpkin patch as a family last week and she could have cared less about the pumpkins. I practically had to make her sit for a pumpkin picture. She was all about the hayride and pony rides. 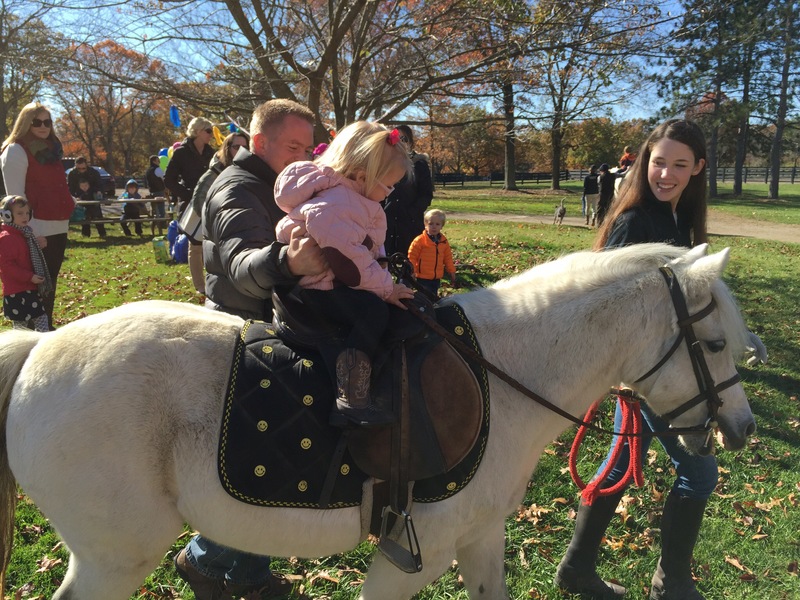 And she also attended a birthday party with pony rides. Those cowgirl boots are getting worn in. Get this: she wants a pony for Christmas. Too bad that doesn’t fit in Santa’s sleigh (or his budget). She’s looking less and less like a toddler and more like a kid. 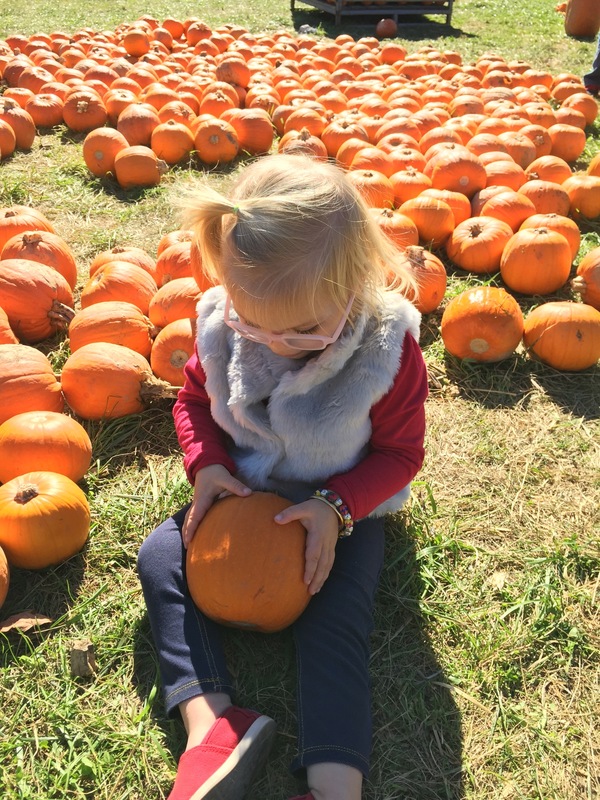 O also now has quite the fashion sense… this season she’s big on side ponytails, vests, jeggings, Toms, cowboy boots, rain boots, and bracelets galore! You know, if you take your fashion cues from almost-3-year-olds. She always puts her shoes right next to mine. 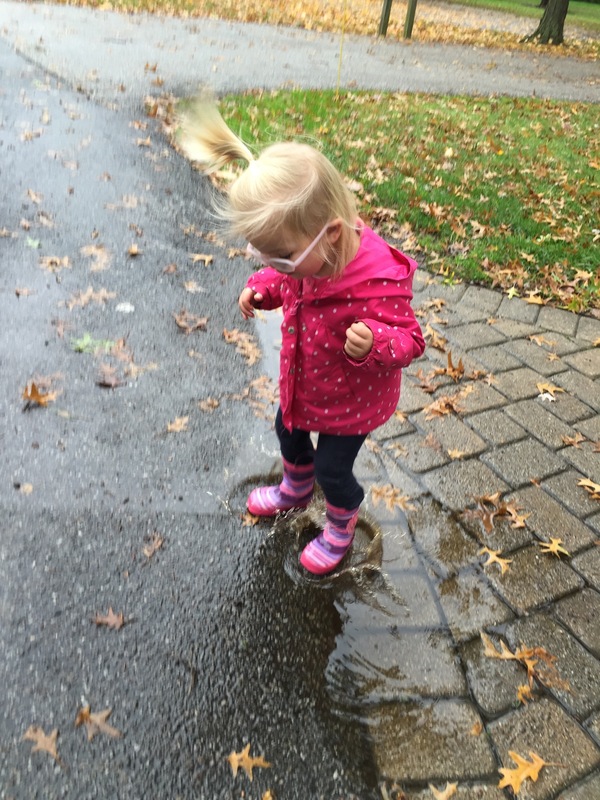 And on rain days she begs to go “puddle jumping” on the way to the bus stop. Being two and a half is so much fun! O has also taken up painting. She’s always liked coloring and drawing. Up until now we used Magnadoodles, chalk boards, computer paper and notebooks for art. 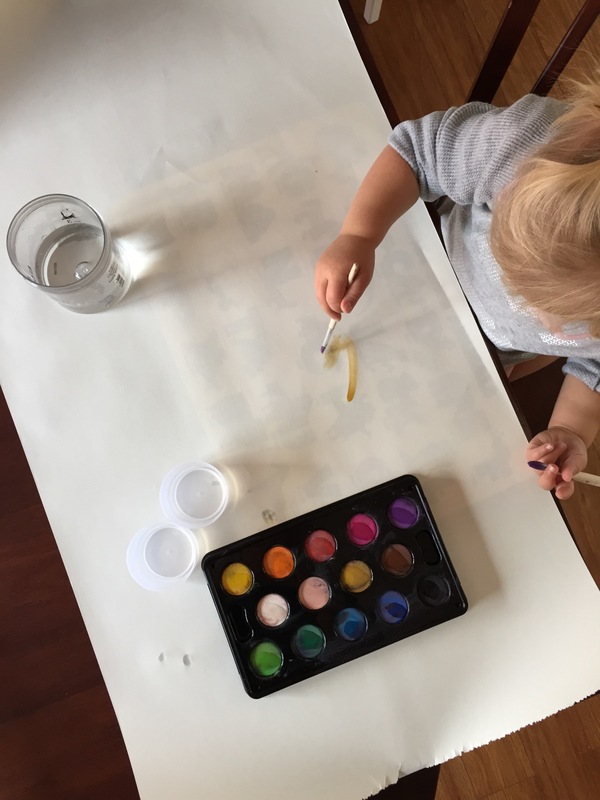 On a recent trip to Ikea we found a little set of watercolors complete with brushes and water cups. I also grabbed a roll of paper. She’s been a painter ever since. Great for patching time too! This was the first year O was really into Halloween. For the past two years we had chosen her costume (bumble bee and Elmo). 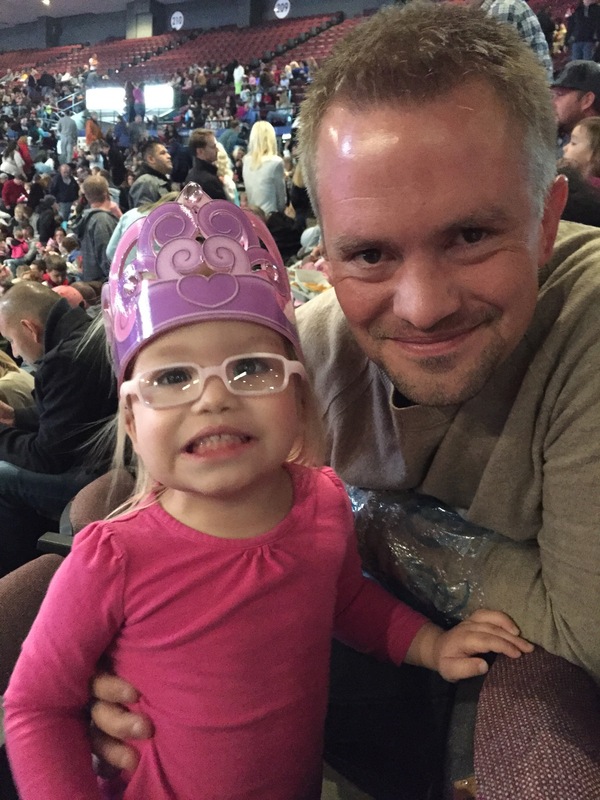 This year she knew she wanted to be Elsa (from the movie Frozen … in case you live in a hole) for months. I found a costume in early September at Target for a cool $20 and I jumped all over it… because as I suspected all the other Elsa dresses I saw later were double that price a few weeks later. Due to the weather, we incorporated a fur vest into Elsa’s wardrobe. I think it worked out. You can’t tell in the pictures, but she insisted on wearing her cowboy boots under that dress. 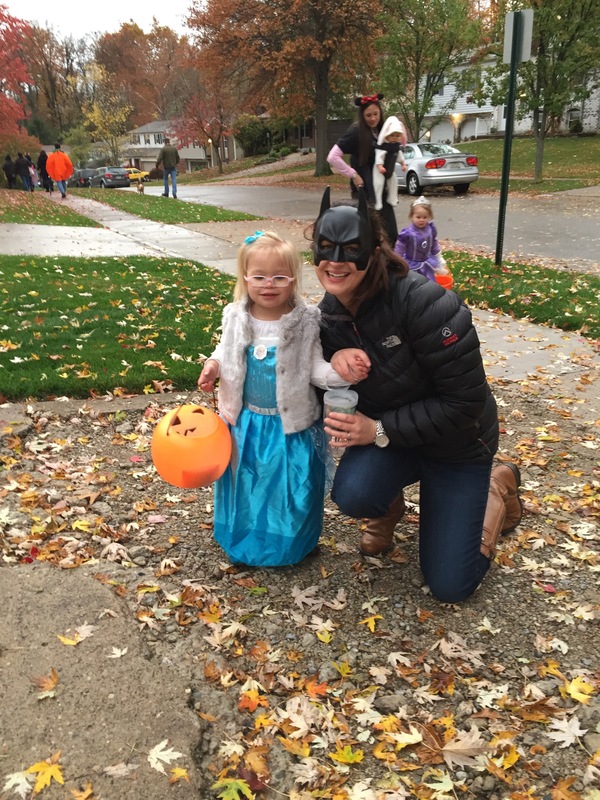 Of course, I was Batman… er, um… Batmom? 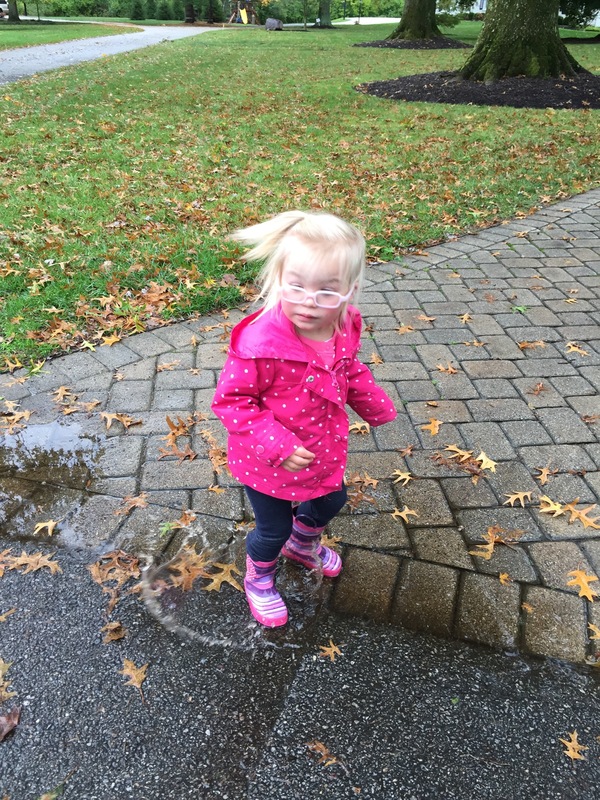 She made it to a dozen or so houses… that’s a lot of walking for those little legs. O had more fun handing out our candy and treats. 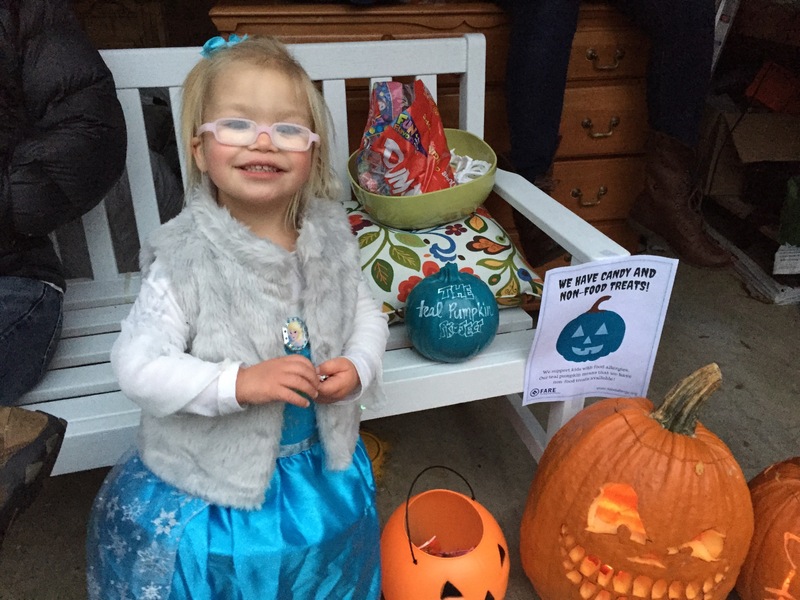 You may recall that she has moderate food allergies (milk and eggs) so we participated in the Teal Pumpkin Project that I blogged about earlier this month. We handed out spider rings, vampire teeth and (practically every allergy free) Dum Dum suckers. In addition to choosing her own costume, O is old enough to tell us what kind of face she’d like on her pumpkin. She chose Hello Kitty. 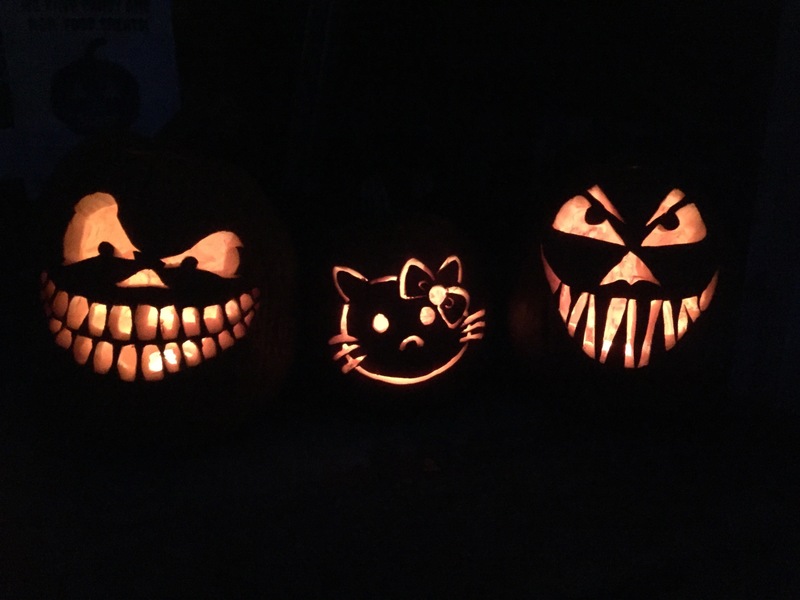 It was a bit of a challenge to carve, but I forgot how much I love to carve pumpkins until we started! 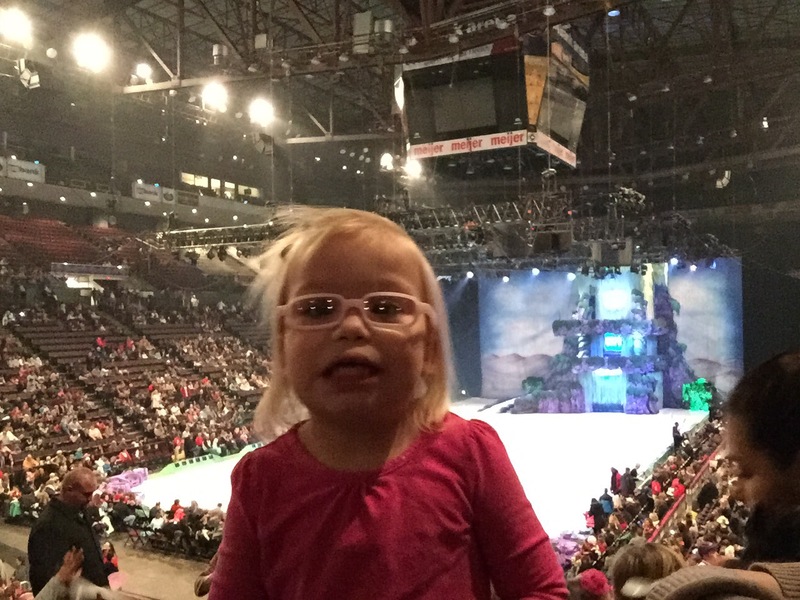 As a special surprise we treated O to a trip to Disney on Ice. We didn’t tell her until we arrived at the show and she was so excited. Below is her “excited” face. Hubby and I had fun too. I was impressed with the show! Worth every penny. Even this $12 foam crown. It came with cotton candy… which she hated and Mommy and Daddy devoured. O also went to the Ophthalmologist last month. 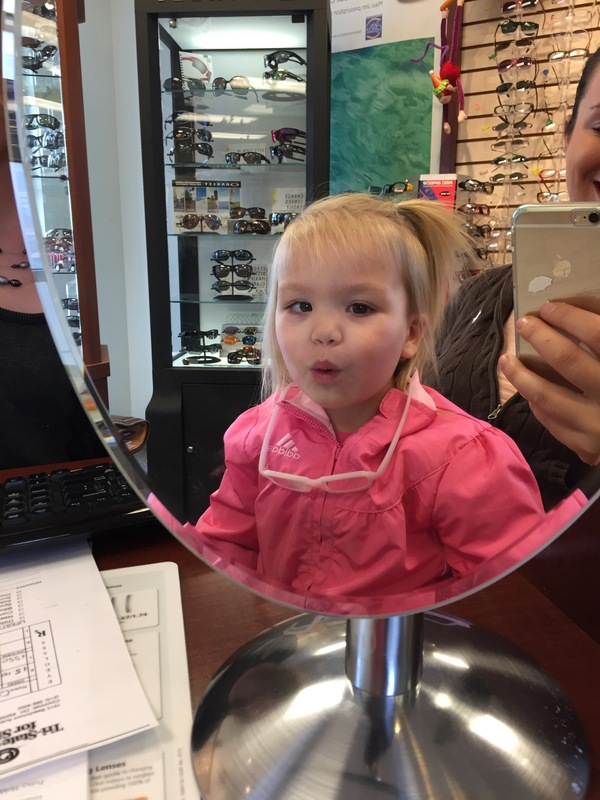 We learned that her prescription increased to +5.00 in the right eye and +5.50 in the left eye. We weren’t really surprised by the increase because she’s growing and changing. She was so small (18 months) at her last major exam that it can be hard to get completely accurate measurements. We’ve ordered he new frames and lenses and are awaiting their arrival. 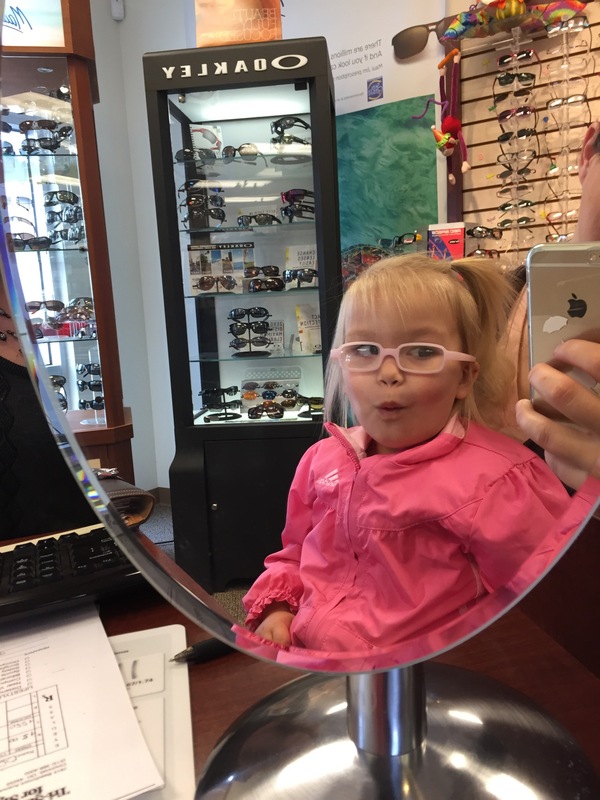 She will still be patching 3 hours a day (over the right eye) for the Accomadative Esotropia and Ambloyopia. 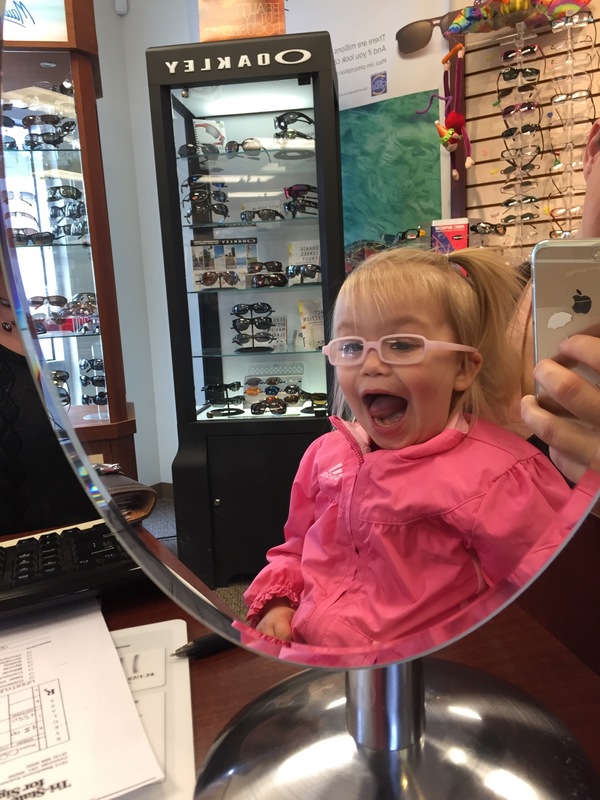 She was being silly in the mirror when we were ordering her new glasses.